Top quality POW/MIA flags (Single Face) made from durable heavyweight knitted-Nylon and Polyester. They are finished with a strong canvas heading and 2 brass grommets. These flags look great both outdoors and indoors. 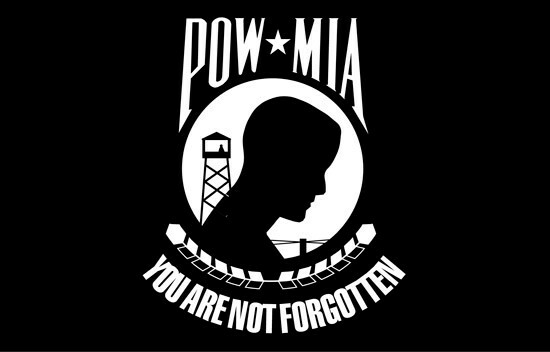 Top quality POW/MIA flags (Double Face) made from durable heavyweight knitted-Nylon and Polyester. They are finished with a strong canvas heading and 2 brass grommets. These flags look great both outdoors and indoors. 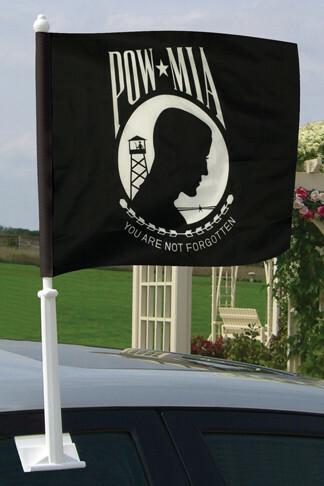 The POW/MIA Auto Window Flag comes complete with a 12"x13" polyester flag and a one-piece plastic bracket. 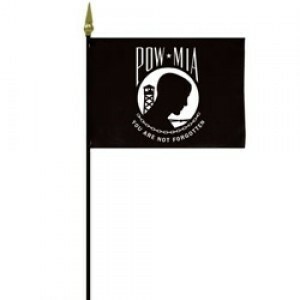 Top quality mounted POW/MIA 4"x6" flags made from durable E-Gloss Polyester and have a gold spear.